I love citrus fruits and during this time of the year...they're readily available. From October through early March we can find them in the northeast at a decent price. I love all kinds of citrus fruits: lemons, limes, grapefruit, tangerines and more! Today's guest post recipe is courtesy of Limoneria. You can join Limoneira spokesperson Megan Roosevelt as she brings this and other recipes for delicious summertime treats to the Limoneira YouTube channel all month long. Directions: Begin by juicing the entire grapefruit. (The good news is, Limoneira citrus is notoriously juicy. Bring on that flavor!) Add all ingredients to a blender, and blend on high for about one minute. You'll want to serve your delicious smoothie immediately. Enjoy! 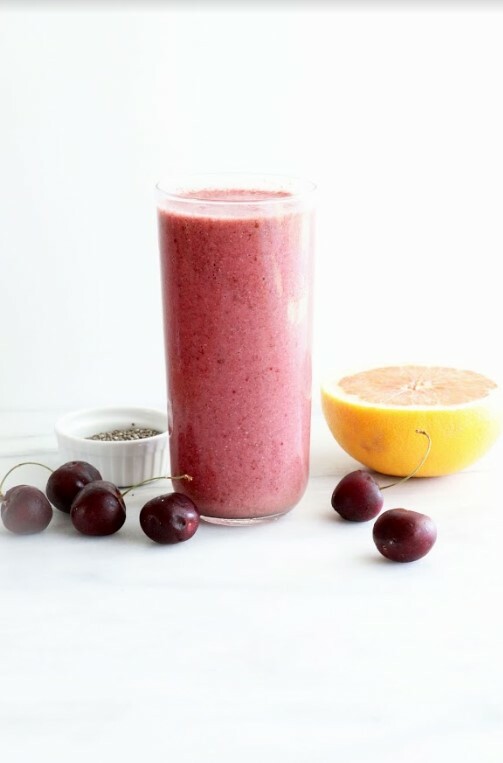 I love this combination of grapefruit with cherries. The chia and yogurt makes the smoothie even more healthy.